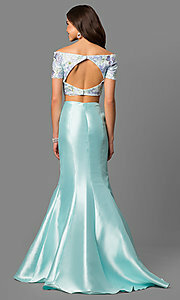 Alyce long open back mermaid off-the-shoulder prom dress with an open back, short sleeves, and a beaded and lace top. The model wearing blue radiance/multi is 5'9" and wearing 4.5" heels. Top 12", Bottom 48", Hollow to Hem 63"